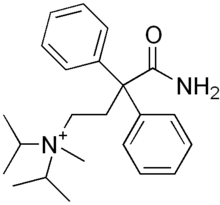 Isopropamide (R5) is a long-acting anticholinergic drug. It is used in the treatment of peptic ulcers and other gastrointestinal disorders involving hyperacidity (gastrointestinal acidosis) and hypermotility. Chemically, it contains a quaternary ammonium group. It is most often provided as an iodide salt, but is also available as a bromide or chloride salt. It was discovered at Janssen Pharmaceutica in 1954. Seeherman R, Isopropamide iodide: a long-acting anticholinergic, Del Med J. 1957 Oct;29(10):265-9. Boss EG Jr, Buchanan GC, Effect of isopropamide iodide on basal gastric secretion in the human, Gastroenterology. 1957 Nov;33(5):730-6.